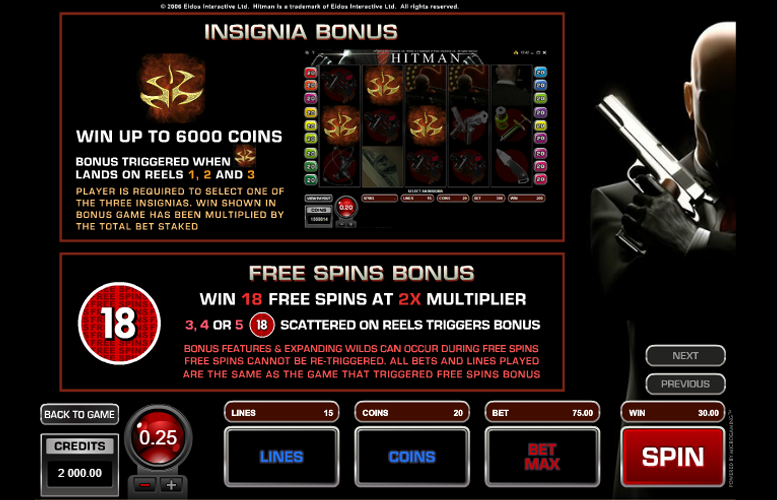 The Hitman slot machine from Microgaming is based on the video game of the same name. As you’d probably expect, it’s all about getting people bumped off for cash! The game has lots of different special features. These include a free spin mode and a “pick me” style game. As well as these exciting side games, the prizes are particularly top heavy. This makes for an exciting title in all respects. Artwork suits the macabre theme. It’s a dark and moody looking machine and this is complementary to its subject matter. High main game and bonus game wins. We love top-heavy machines like Hitman. What’s not to like about dropping a massive pay-out! Plenty of interesting bonus features. There are three different games and an expanding “wild” feature too. This makes for a lot of replay value. Being a video game, not everyone will know the subject matter. This isn’t too much of a problem but might make one or two players bypass this title. The top win possible on Hitman is 270,000 coins won via the Contract bonus game. Sniper = 4,000x the line bet. Shadowy Hitman = 2,000x the line bet. Back of Hitman’s head = 1,500x the line bet. Envelope of Money = 1,000x the line bet. 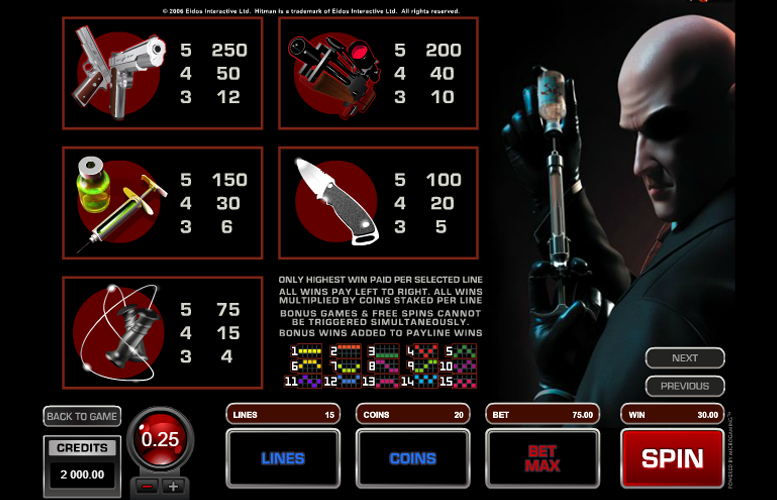 Players can win up to 270,000 coins on the Hitman slot machine. The Contract Bonus is triggered when the “Bonus” laptop lands on reels three, four, and five simultaneously. 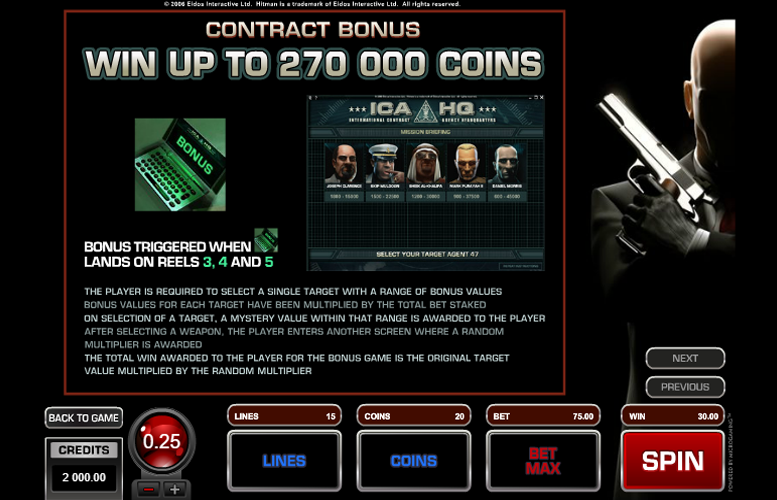 During this special feature, the player is required to select a single target with a range of bonus values. The bonus values for each target have been multiplied by the total bet staked. When the player selects a target, a mystery value within that range is awarded to them. After selecting a weapon, the player enters another screen where a random multiplier is awarded. The total win awarded to the player for the bonus game is the original target value multiplied by the random multiplier. During the Insignia Bonus, players can win up to 6,000 coins. This bonus is triggered when the Insignia symbol lands on reels one, two, and three. The player is required to select one of the three insignias to reveal a prize. The win shown in this bonus game will have been multiplied by the total bet staked. Hitman’s Free Spin Bonus consists of 18 free spins with a 2x multiplier. Landing three or more “18” symbols scattered on the reels will trigger the special feature. During the Free Spin Bonus, other features and expanding “wilds” can occur. These free games cannot be retriggered, however. All bets and lines played are the same as the game that triggered the free spins bonus. The Hitman “wild” symbol will expand to fill the remaining positions on either reel two, three, or four. It will complete any possible wins. Pistols = 250x the line bet. Sniper rifle = 200x the line bet. Poison shot = 150x the line bet. Knife = 100x the line bet. Choker = 75x the line bet. 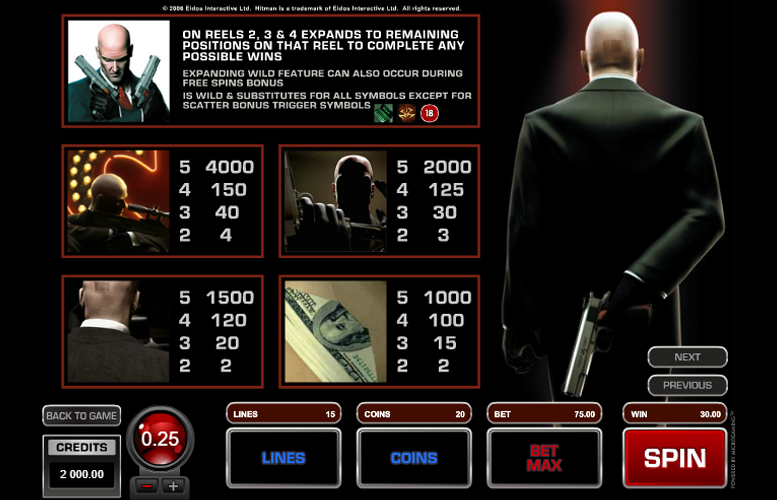 Players are given the maximum number of ways to vary their stake on the Hitman slot machine. There is the option to adjust the value of each coin wagered, the number of coins bet per line, and the number of lines used. The highest and lowest coin values are 1p and 25p respectively. Players can select between one and 15 lines. Finally, they can choose to bet any number between one and 20 coins on each line. This means, with all values set to the minimum, the lowest possible bet per spin is just 1p. Meanwhile, with everything maxed out, the largest possible bet per spin is £75. Whilst not massive, this should satisfy all but the very highest rollers around. 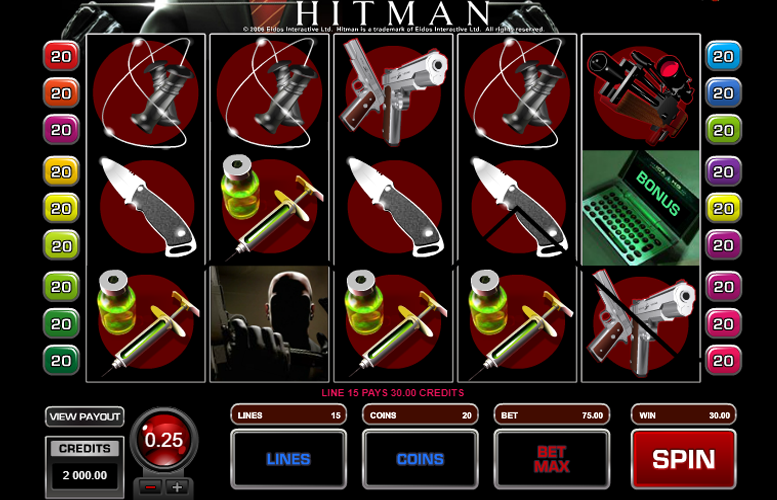 Players looking for an exciting video game-themed title need look no further than the Hitman slot machine from Microgaming. It has various special features that really add to the title’s replay value. In addition, there are some massive prizes on offer. The only caveat might be the relative obscurity of the title. This is a shame because everything else about it is great. This game has a rating of 4 / 5 with 423 total reviews by the users.